I think probably one of the most popular activities in our house is to draw on the mirrors in our dining room with window markers. More specifically, the boys really love to trace letters using the window markers. This particular activity has been a favorite for about two years now. It's easy to set up and is great prewriting practice for kids. 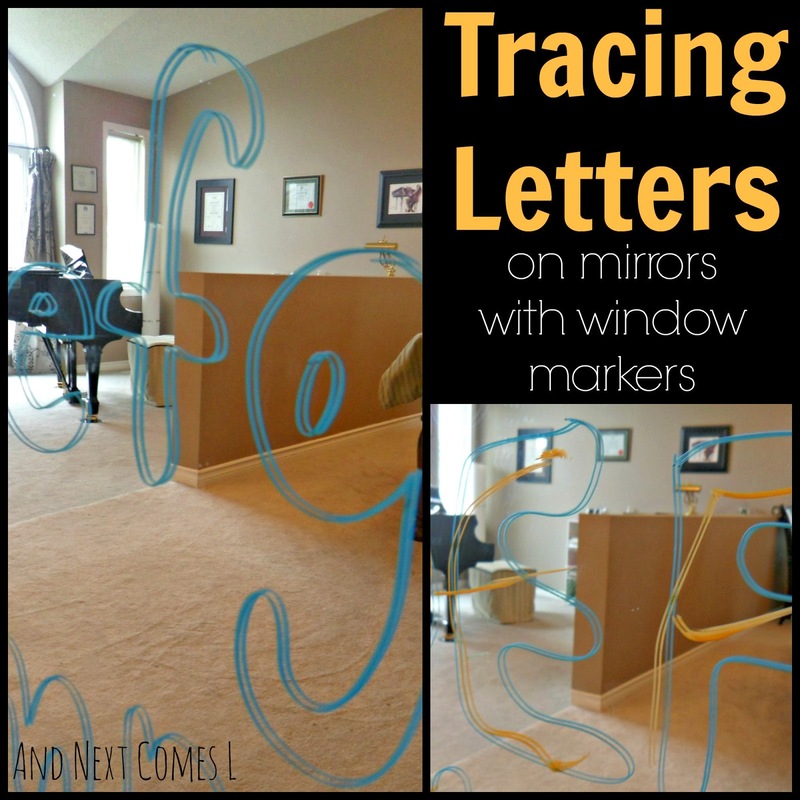 To set up this activity, I drew bubble letters, both uppercase and lowercase, on the mirrors using window markers. J always calls bubble letters, "New Letters." Makes me giggle every time. And yes, my mirrors are usually always that dirty and covered with fingerprints. The boys will usually trace the letters with their fingers first or point and identify the letters or in this case, sing the alphabet while pointing to the letters. Then the boys usually grab a window marker, a different color than what I used to draw the bubble letters, and start tracing the letters. K mostly just scribbles and colors over each letter, but at least he identifies the letters before he colors all over them. J, on the other hand, is a pro. He quickly draws all the letters inside the bubble letters. As you can see below, J is pretty good at this. It's really how he learned how to write letters when he was around 2.5 years old. We have done this same technique to practice writing sight words, the boys' names, numbers, and more. And thankfully the boys enjoy the cleanup part as much as the actual writing part! Don't have window markers? Use tape instead to make some tape letters! Be sure to read the other literacy posts in the Light & Reflections Series. I love this idea! It adds a fun way to practice letters as opposed to just writing them on paper. Definitely trying this! It is definitely more fun than writing on paper! What a great idea! I like how you made bubble letters so they can trace the inside! We'll have to try this! Thanks! Bubble letters is the way to go! Love this idea! I'm trying it soon with my daughter who's getting kind of tired of tracing letters, but will use window markers eagerly any day! Window markers are a favorite here so if your daughter loves them, then I'm sure this activity will go over very well with her!